Place a wealth of hanging adornments throughout your garden using these Achla Graphite Heavy-Duty Double Shepherd Hooks. The classic shape of these five, wrought iron units brings a timeless look to any setting, and the dual hooks on each provide plenty of space for backyard beautification. The generous, straight shaft lends wonderful height to these hangers, and the upward curl on each arm creates a convenient hanging spot. The units can all accommodate a 20" diameter or smaller decoration on each side, and one hook removes for versatility. A trident base on each piece provides a sturdy, 11" anchor for the entire hook, and sports a tapered wedge for added stability. Their powder coated, graphite colored finish lends a unified look to your garden, while protecting the hangers from the elements. Showcase bird feeders and other items throughout your yard with these Graphite Heavy-Duty Double Shepherd Hooks. Assembly required. Note: This case pack contains 5 of the Achla Heavy-Duty Double Shepherd Hooks, Graphite. 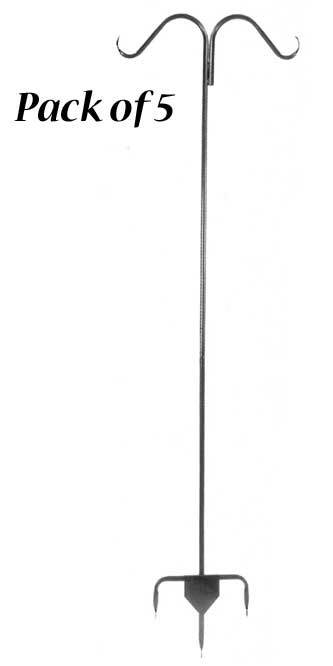 Achla Heavy-Duty Double Shepherd Hook, Graphite, 7'9"
Achla Square on Squares Double Pole Trellis, Graphite, 83.5"